I saw a post on Instagram recently that featured this amazing dry marble manicure by Sveta Sanders. I had seen quite a few dry marbled manis before, but I really loved her use of 3 different colors. So I decided I wanted to try it out! I think mine came out alright – definitely not the same as my inspiration, but still pretty cool! My index finger is a bit messy because I slopped on too much white polish, but I really like how my middle finger turned out. I think with more practice, this could be a go-to technique! It was quick and easy, and I really liked the outcome. Now the colors I chose ended up a bit Christmassy, but I didn’t intend that. I wanted to use another of my Ellagee glitters from the Villianous Holo-ween collection (see Poor Unfortunate Souls here), and I took my color scheme inspiration from the glitter. Playing around with new hand positions – look at that glitter!! Base color: Polish My Life Greenwich Street… this is an interesting green. It’s one of those ugly pretty colors, kind of like a slightly pastel pistachio green. It reminds me of OPI’s Gargantuan Green Grape, but this is a bit more kelly green whereas GGG leans a bit mint. The formula is amaaazing, which is what I’ve found with all Polish My Life cremes! 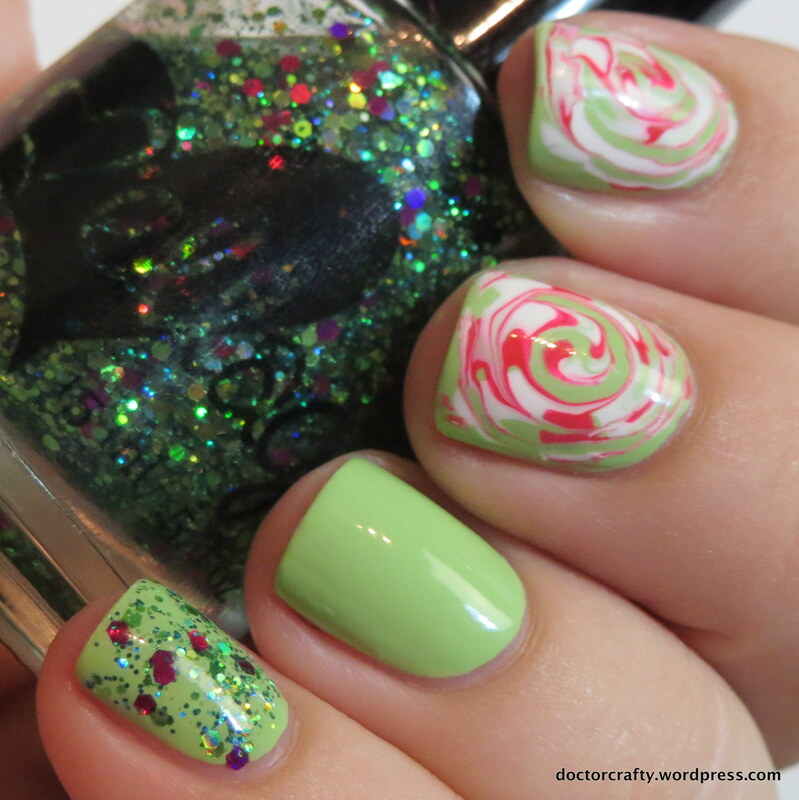 Swirl: Zoya Purity (white) and China Glaze Rose Among Thorns… RAT is such a pretty bright pinkish fuchsia. Glitter: Ellagee Friends on the Other Side… a goooorgeous glitter topper that has fuchsia hexes and green hexes and microglitter. I just need one coat for great glitter payoff – it’s PACKED! Anyways, what do you think of this manicure? Have you tried dry marbling? If so, do you swirl or do a different technique? Also, what do you think of the hand position for my second pic? I’ve been playing around with different positions (HAND positions you dirty-minded people!). This entry was posted in Nails and tagged china glaze, china glaze rose among thorns, dry marble, dry marble manicure, ellagee, ellagee friends on the other side, manicure, nail art, nail polish, nails, polish my life, polish my life greenwich street, zoya, zoya purity on October 17, 2014 by doctorcrafty. Lol! Great minds 😉 Can’t wait to see yours – I’m sure it’ll be gorgeous! The middle finger is perfect!!! I have to try this type of manicure! It turned out perfect! Well done!!! I’m absolutely in love with your middle nail…I need to find time to try this over the weekend! Thank you so much! I’m pretty proud of how that one turned out 🙂 You definitely should try it out – it’s fun! Yes – like little candy canes or peppermints! Haha – go get em girl! This is really awesome! I haven’t tried it out yet but I definitely want to now after seeing yours! Totally unintentionally christmas-y though, haha, I agree! Thanks Kirby!! You should definitely try it – it’s like fingerpainting! These look so cool! I saw her tutorial too and was so amazed. Thanks! It was surprisingly easy to do once I figured out the right amount of polish to blob on! Thank you! It took a bit of practice, but I was real happy with it 🙂 I agree – candy canes! I saw that tutorial and thought it was SO COOL! I love how yours turned out! It definitely does remind me of peppermints. And gah…those Ellagee glitters are killing me! Yeah – Sveta does a mean manicure! And YES, Ellagee glitters are amazingly gorgeous!! This is so pretty! I’ve never tried this before but it looks like fun! Thank you so much! You should try it – it is, indeed, fun! I can totally see how these can turn out as big ol’ messes. But yeah – with similar finish polishes and not too much of one vs the others, it can be super pretty!! Aww thanks friend! I think I might have to revisit this hand position again 😉 And you should definitely try dry marbling!